Last year, a couple weeks before Thanksgiving, we were at the airport getting ready to board a plane for a quick trip to New York. At the newsstand, I picked up a cooking magazine with instructions on planning a flawless Thanksgiving dinner. Since that upcoming Thanksgiving would be my first time hosting dinner at our new apartment, the first time I would make dinner for Thanksgiving period, I thought, why not give it a try. After all, I really wanted to host an unforgettable dinner so I could use all the advice I can get. The day came and went and my mission was accomplished and I was left with the best technique for roasting the perfect turkey. The key is brining. The result is the most succulent meat. I decided to employ this method with cornish hens; it is a smart way of roasting poultry to get added flavor and to prevent the meat from drying out without having to add a ton of butter. You are probably thinking this is a lot of work for such a small bird. Yes it is but the results are worth it. And with a little planning, this should not be a tedious endeavor. 1. Bring the brine ingredients to a boil. Allow to cool to room temperature. Place hens in brine, cover and refrigerate overnight or for at least eight hours. Remove the birds from the brine and rinse with cold water. Pat dry with paper towels. 2. Set oven to 400 degrees F. Place hens in a roasting pan and season liberally with dried thyme, salt and pepper, remembering to also season the cavity. Stuff the cavity of each bird with a handful of fresh cilantro. Roast in oven for 1 hour, rotating 180 degrees halfway through. If you find that the birds are getting too dark too quickly, cover with foil and continue to roast. Remove from the oven, and let rest, covered in foil, for 10 minutes before serving. Hi Natasha! This looks so delicious. I often marinate small chickens overnight in a soy sauce based marinade, but I never realized that it was probably the same thing as brining. Thanks for making me think a bit! You're very welcome Tom! Brining is great technique. I will be using it more often. Wow looks yum yum. Belated wishes to Saul. Cake looks mouth watering. This is a GREAT recipe!! 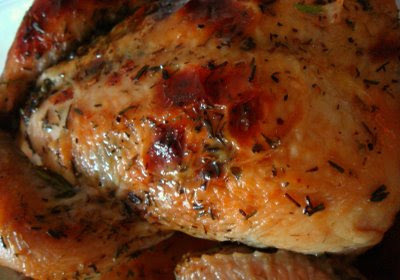 It tasted fantastic and was so juicy and tender, because of the brining. This was the first time I tried it with the cornish hens, and it made such a big difference.